The aim of phase 1 of the project is to develop a general account of the epistemic features of explanations, of how explanations connect to understanding, and of those features in virtue of which different explanations of the same explanandum may differ in their explanatory power. The aim of phase 2 is to give a thorough philosophical account of the explanation of social phenomena. Since 2011, the project organizes annual workshops in the “Explanatory Power Series”. This year (September 2015), a Colloquium will be held at the GAP9 Conference in Osnabrück, with Jonathan Schaffer, Benjamin Schnieder, and Michael Strevens. R. van Riel, ‘Reduktion und Emergenz’, in: M. Schrenk (Hrsg.) Handbuch Metaphysik, Metzler (im Erscheinen). R. van Riel, ‘Real Knowledge Undermining Luck’, Logos and Episteme (accepted). R. van Riel, ‘What is the Problem of Explanation and Modeling?, Acta Analytica (accepted). Markus Eronen, Raphael van Riel: ‘Understanding Through Modeling: The Explanatory Power of Inadequate Representation’, Synthese 192. doi:10.1007/s11229-015-0973-0, 2015. R. van Riel, ‘What is Constructionism in Psychiatry? From Social Causes to Psychiatric Classification’, Frontiers in Psychiatry, 2016, DOI: 10.3389/fpsyt.2016.00057. R. van Riel, ‘If you understand, you won’t be lucky’, Grazer Philosophische Studien 93, 2016, 196-211..
R. van Riel, ‘The Content of Model-Based Information’, Synthese (in print). 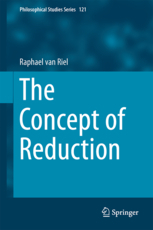 R. van Riel, ‘Reduction Beyond the Reduction Debate’, The Concept of Reduction Philosophical Studies Series, Springer: 2014. Book Review: R. van Riel: Michael Weisberg: Simulation and Similarity. Using Models to Understand the World. Oxford: OUP 2013. Zeitschrift für Philosophische Literatur 1, 2013, 60-70. Reuter, K., Kirfel, L., van Riel, R. Barlassina, L.: ‘The Good, the Bad, and the Timely: How Temporal Order and Moral Judgement Influence Causal Selection’, Frontiers in Psychology, doi: 10.3389/fpsyg.2014.01336, 2014. R. van Riel, R. N. Van Gulick: ‘Scientific Reduction’, in: E. Zalta (ed.) The Stanford Encyclopedia of Philosophy, 2014. Apparently, some entities have a social function. For instance, a university has the function to educate. Some objects are at least partly characterized by their intended or actual social function; and referring to an object’s social function, we can sometimes explain its persistence as well as why an object ceased to be. It is commonly assumed that newspapers have the function to inform people in a timely manner. And the decline of newspapers is often explained by the alleged fact that they cannot compete with information provided by the world wide web; it appears that due to a change in context, they do not fulfill their function as well as they once did. The commitments that go together with such descriptions and explanations are not well understood. The aim of the project is to further discussion about social functions within philosophy, and to outline a theory of social functions, taking into account normative and ontological aspects, as well as historical aspects of the philosophical debate. The project brings together philosophers trained in analytic philosophy from the Universities of Basel, Berlin, Duisburg-Essen, and Münster. Book Review: R. van Riel: Jason Stanley; ‘How Propaganda Works’, in: Moral Theory and Ethical Practice, (online first) 2015: DOI: 10.1007/s10677-015-9667-4. The project brings together philosophers trained in analytic philosophy from the Universities of Duisburg-Essen, Bochum, and Dortmund, all part of the UAMR-University alliance, to work on topics such as implicit bias, gender and race concepts, and the notion of ideology. In May 2015, the project organized a conference with Sally Haslanger, Esa Diaz Leon, and Mari Mikkola at the Institute for Advanced Studies in the Humanities. The project focused on the notion of moral enhancement and its significance to the enhancement debate. The interdisciplinary project inspired empirical work as well as ethical and theoretical discussions. Two conferences were held in Bochum. R. van Riel: ‘Enhancing beyond what ought to be the case’, Bioethics, forthcoming. R. van Riel, E. Di Nucci, J. Schildmann: Enhancement der Moral, Mentis: 2015. R. van Riel, J. Schildmann: ‘Enhancement der Moral’, in: van Riel, Di Nucci, Schildmann: Enhancement der Moral, Mentis: 2015. In my dissertation, I proposed a novel characterization of the concept of reduction. Based in this characterization, derivative notions of reduction can be characterized, which capture core uses of the term ‘reduction’ within the philosophy of science, the philosophy of mind, and in metaphysics. It is argued that ‘reduces to’ generates hyper-intensional contexts and, thus, expresses a four-place relation. The asymmetry of reduction (even when it presupposes identity) can be accounted for, and various models of reduction are captured by the framework that emerges (e.g. the Nagelian model of reduction and models of functional reduction). R. van Riel, ‘Reduktion’, in: Schrenk, M (ed.) Handbuch Metaphysik Metzler (invited, in preparation). R. van Riel, ‘Pains, Pills, and Properties. Functionalism and the First-Order/Second- Order Distinction’, Dialectica 66, 2012, 543-562. R. van Riel, ‘Identity, Asymmetry, and the Relevance of Meanings for Models of Reduction’, The British Journal for the Philosophy of Science, 2012, doi: 10.1093/bjps/ axs028. R. van Riel, ‘Cognitive Significance and Epistemic Intensions’, Logique et Analyse 54, 2011. R. van Riel, ‘Nagelian Reduction beyond the Nagel Model’, Philosophy of Science, 78/3, 2011, 353-375. R. van Riel, ‘Identity-Based Reduction and Reductive Explanation’, Philosophia Naturalis, 47-48 (1-2), 2010-2011, 185-221.